My major studies and practice of Cranial Sacral Therapy has been through the Upledger Institute in Palm Beach Gardens, Florida. I also studied Cranial Sacral Therapy through Dialogues in Contemporary Rehabilitation. In my daily practice as a Doctor of Oriental Medicine, I use many aspects of this valuable therapeutic tool. I have over 400 hours of classroom studies and clinical practice, and over 800 hours of experience as an Assistant in classroom and clinical settings. Additionally, I worked as a Visiting Therapist for the Upledger Institutes’s Brain and Spinal Cord Dysfunction Center in Palm Beach Gardens, Florida in 1995/1996. I also sponsored two Advanced Cranial Sacral Therapy 5-day classes at my Alternative Health Care retreat facility in 1995 in La Honda, CA. While working in the Brain and Spinal Cord Dysfunction Center, I led the first Therapist Team in a Pilot Program to treat patients in the water with Dolphins at the Dolphin Research Institute at Grassy Key, Florida in 1995. Subsequently, I worked with and treated patients in the water with Dolphins on numerous occasions and in several different locations using Cranial Sacral Therapy, Visceral Manipulation and other therapeutic modalities. I organized and supervised a Cranial Sacral Therapy and Visceral Manipulation Study Group in Santa Fe, NM in 1998/1999. I have admiration for John Upledger and his valuable contributions towards getting Cranial Sacral Therapy knowledge and skills to a wide population of practitioners. The following information about Cranial Sacral Therapy comes directly from the Upledger Institute, Inc. brochures. We are all familiar with the cardiovascular and respiratory rhythms. 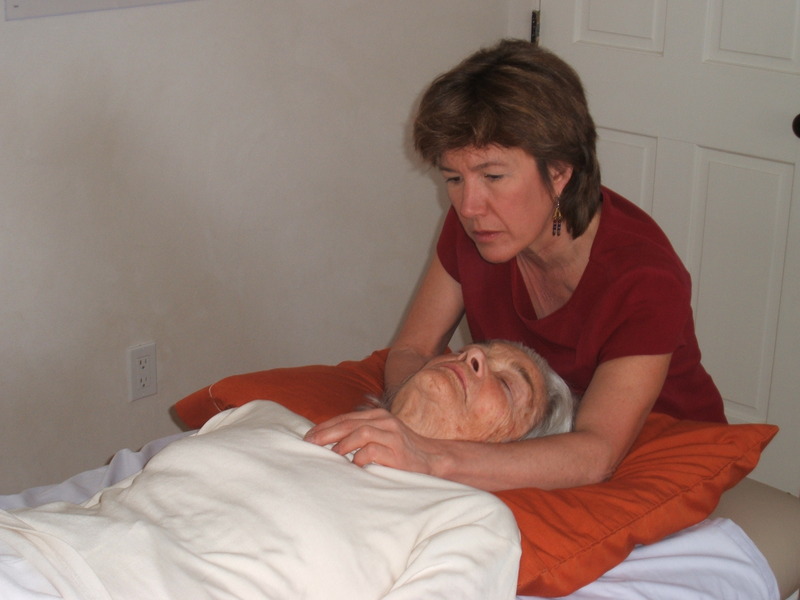 Like them, another body rhythm–the craniosacral system–influences many body functions. An imbalance in this system can adversely affect the development of the brain and spinal cord which can result in sensory, motor and intellectual dysfunction. The craniosacral system is a physiological system that exists not only in humans but in animals possessing a brain and spinal cord. Its formation begins in the womb and its function continues until death. Its name, craniosacral, is derived from the associated bones. Included are those of the skull, face, and mouth–which make up the cranium–and extend down the spinal cord to the sacrum. Membranes enclosing a hydraulic system connect the craniosacral system. For 20 years, osteopathic physician and surgeon Dr. John Upledger has been the chief proponent for using the craniosacral system to evaluate and treat medical problems associated with pain and dysfunction. His research and clinical work with the craniosacral rhythm has led to the development of light-touch manipulative therapy which has been effective in treating poorly understood dysfunctions, chronic pain, lowered vitality and recurring infections. The positive effect of CranioSacral Therapy relies to a large extent upon the patient’s natural self-corrective physiological activities. The therapist’s light, hands-on approach assists the hydraulic forces inherent in the craniosacral system to improve the body’s internal environment. Because of its influence on many body functions, CranioSacral Therapy is used today by a wide variety of healthcare professionals including osteopaths, medical doctors, doctors of chiropractic medicine, psychiatrists, psychologists, dentists, physical therapists, occupational therapists, acupuncturists and licensed body workers. CranioSacral Therapy is used to locate and solve problems. It encourages your own natural mechanisms to improve the functioning of your brain and spinal cord, to dissipate the negative effects of stress and to enhance you general health and resistance to disease. CranioSacral Therapy is a gentle, noninvasive manipulative technique. Seldom does the therapist apply pressure which exceeds five grams or the equivalent weight of a nickel. Examination is done by testing for movement in various parts of the system. Often, when movement testing is completed, the restriction has been removed and the system is able to self-correct. Trained therapists are able to palpate the motion of the craniosacral system anywhere on a patient’s body. Valuable information can be gained very quickly with regard to rate, amplitude, symmetry and quality of craniosacral motion. The regions of the craniosacral system which can be easily palpated are the bones of the skull, sacrum and coccyx because they attach to the membranes enclosing the cerebrospinal fluid. this fluid is filtered out of the blood in a dynamic feedback loop. Pressures build as the amount of cerebrospinal fluid increases, bathing the brain and spinal cord–acting like a semi-closed hydraulic system. When the fluid moves–normally at a rate of six to 12 cycles per minute–the membranes containing the fluid move. Palpation is possible with all of the other bones of the spine and pelvis. because of their less direct effect on the hydraulic system, however, it is more difficult to detect the motion. The same is true of the facial bones and the temporomandibular joints. What I the Origin of the Craniosacral System and Its Therapy? While the existence of the cardiovascular and respiratory rhythms is not disputed today, a debate concerning their reality raged in medical communities around the globe for centuries. Even today, treatment for afflictions associated with these systems remains as diverse as the diseases and their individual practitioners–especially in the area of health maintenance. The history of the craniosacral system’s discovery is fairly recent. In the early 1900s, as an osteopathic student in Kirksville, Missouri, Dr. William G. Sutherland, was struck by an idea. He saw that the bones of the skull were designed as they were to provide the opportunity for movement, in relationship to each other. For more than 20 years he pondered the prospect of moveable bones in the adult skull. He performed makeshift experiments on himself with helmet-like devices designed to impose variable controlled and sustained pressures on different parts of his head. His wife then recorded personality changes he displayed in response to different pressure applications; he described head pains, problems with coordination, etc., related to the varied pressures. In the early 1930s, under a pseudonym in the Minnesota Osteopathic Journal, Dr. Sutherland published his first article about this work. Based on his experiments, he developed a system of examination and treatment for the bones of the skull. With some patient success, Dr. Sutherland organized a small group of osteopaths who studied cranial work with him. His system became known as Cranial Osteopathy. Because so little was known about how it worked and because results with patients seemed at times to be miraculous, Sutherland’s system acquired an understandably esoteric reputation. In 1970, during a surgery on a patient’s neck, Dr. Upledger viewed the rhythmical movement of a membranous boundary of what appeared to be a hydraulic system. None of his colleagues nor any of the medical texts had an explanation for his observation that the Dura Mater, the outer layer of the meningeal membrane, in the neck visibly move in and out at about 10 cycles per minute. He concluded that pressure inside the membrane sack was fluctuating rhythmically. Two years later Dr. Upledger attended a seminar which explained Sutherland’s ideas and taught some of his evaluation and treatment techniques. Coupling his scientific backgraound with a tactile sensitivity, Dr. Upledger was quick to understand how a hydraulic system might function inside a membranous sac encased within the skulll and canal of the spinal column. Dr. Upledger incorporated and refined Dr. Sutherland’s techniques with success. In 1975 he was asked to join the Osteopathic College at Michigan State University as a clinician-researcher and professor in the Department of Biomechanics. He led a multidisciplinary research team made up of anatomists, physiologists, biophysicists and bioengineers through the maze of research which first established the scientific basis for the craniosacral system. The team was able to explain in scientific and practical terms the function of the craniosacral system. It also showed how this system could be used to evaluate and treat malfunctions involving the brain and spinal cord as well as a myriad of other health problems that previously were misunderstood or poorly understood. In the two decades since his initial research, Dr. Upledger has written three textbooks: CranioSacral Therapy; CranioSacral Therapy II, Beyond the Dura and Somato Emotional Release and Beyond explaining the functioning of the craniosacral system in detail. In 1985, he established The Upledger Institute, Inc., a clinical and educational resource center. Since then, thousands of healthcare professional have studied the therapeutic value of the craniosacral system. I have multiple chemical sensitivities and have been seeing Rebecca weekly for about 2 years. For years before that, I was treated by various physical therapists, osteopaths, chiropractors and other acupuncturists. I always felt worse afterwards. Rebecca is the only one that has been able to treat me at a pace and quality that matches my body’s needs. She is compassionate, empathetic, very respectful and so “in-tune” with her patients. Her instincts are impeccable. After being chronically ill most of my life, I am believing that my health can and is improving. My chemical sensitivities are decreasing. Oh…before Rebecca, I reacted badly to acupuncture…Now…I love acupuncture treatments.